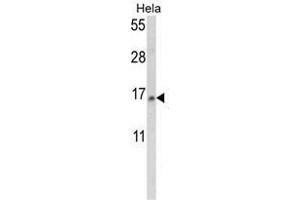 Western blot analysis of SNRPD2 Antibody (N-term) in Hela cell line lysates (35ug/lane). SNRPD2 (arrow) was detected using the purified Pab. Specificité This antibody reacts to SNRPD2.